It would seem as plain as the nose on your face: There’s a ready market here in Boulder and the entire state of Colorado for marijuana pipes of all kinds, including those made from ashwood (see below) . . . And yet, Isabel McDevitt is NOT tapping into it. If this program is ever to become worthwhile from a profit standpoint, this must change. Let’s face it, most homeless people including the Ready to Work crowd are smoking weed every day; so are many other Boulderites from all walks of life and transients who come here. Put TreeOpp Cannabis Pipes in every dispensary and recreational pot shop in the state! You’re welcome, Isabel . . . The Homeless Philosopher is always glad to lend his advice to do-gooders who are struggling with logic and common sense. This entry was posted in Homelessness, Only in Boulder, Politics and tagged ashwood marijuana pipes, Bridge House Ready to Work, Isabel McDevitt, TreeOpp on December 28, 2016 by homelessphilosopher. 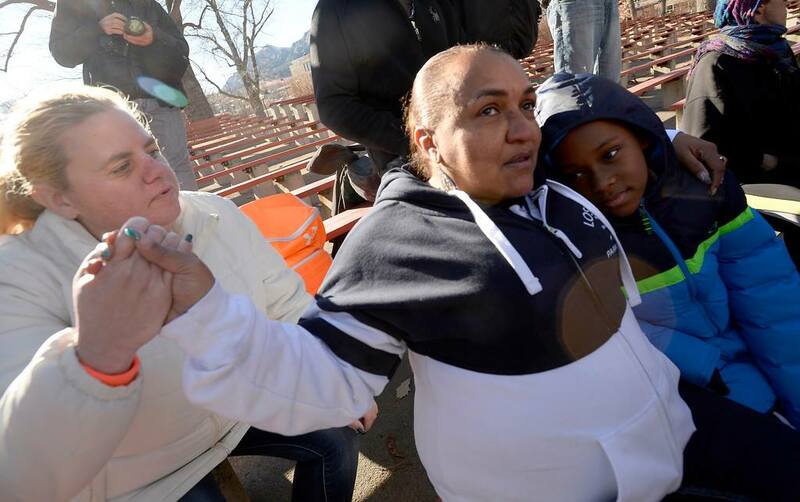 Elizabeth Fanshier, on the left in this Daily Camera photo from a sob story about the Boulder Homeless Memorial last Friday (12/23/2016), has been in and out of transitional living programs and subsidized housing many, many times in the years I’ve been here (since early 2008). It’s also my understanding, from Ms. Fanshier’s own statements, that she has given birth to six babies — NONE of whom she has custody of NOR does she support them financially. This is what’s wrong with social services AND the do-gooders running things here in the Boulder Bubble . . .
BTW, I recognized just a few of the names listed with this story, and it’s probably safe to say that most of the nineteen deceased homeless people had no ties to Boulder, CO — except for being here briefly to grab all of the Free Stuff they possibly could. This entry was posted in Homelessness, Only in Boulder, Politics and tagged Boulder Homeless Memorial 2016 on December 26, 2016 by homelessphilosopher. HELP BOULDER COUNTY’S OWN HOMELESS MEN, WOMEN, AND CHILDREN! The Boulder area traded a white Christmas for a windy one. Winds held steady above 60 mph throughout the city up until Sunday evening, according to the National Weather Service, with gusts near or above 90 mph recorded in multiple foothills locations, including NCAR, Gold Hill and Rocky Flats. The winds downed power lines and caused thousands of outages throughout Boulder and Broomfield counties, with more than 3,000 losing power Sunday afternoon in south Boulder, and another 1,500 losing power in the area of downtown Louisville. About 1,000 were also without power over the afternoon in the area of the Broomfield Industrial Center. Other smaller outages were reported elsewhere in Boulder, including along Baseline Road and 28th Street. Many of the outages were resolved by the early evening, but some customers, including in south Boulder and in Louisville, weren’t expected to regain power until close to midnight. In addition to downed power lines, fallen trees and swirling debris were also reported in pockets of the city of Boulder, in Niwot, Erie, Lafayette and unincorporated county neighborhoods. At my campsite in north Boulder, near the intersection of N. Broadway & U.S. 36, I retreated into my burrow by 9AM when it seemed that the forecast snow had arrived; only a dusting appeared. Settling in to read the Lincoln biography I received as a Christmas present from one of my Dakota Ridge neighbors, “Team of Rivals” by Doris Kearns Goodwin, it was only a brief time before the wind was howling — and it kept up for hours. Despite being in a somewhat sheltered location, I feared my tarp would be swept away along with all of my camping gear and me with it . . .
To make matters worse, I’ve been remiss by not drinking enough water to avoid the most unsettling symptom of dehydration: dizziness. I almost passed out when I crawled out of my hole last night after the wind had died down. This will not do; I might die of exposure with warmth just a few feet away. Then (horrors! ), the do-gooders would use my passing to raise more money for the almost exclusive benefit of the worst-behaved transients. I’ll be damn sure to drink at least a couple of liters of water daily from this day forward. Do NOT buy a used car from this man! This entry was posted in Friends of the Homeless Philosopher, Homelessness, Only in Boulder, Politics on December 26, 2016 by homelessphilosopher. Boulder has about 500 homeless people at any given moment, although it’s difficult to come up with a definitive number because of the inherent difficulties in tracking a population with no fixed address. Regardless of how many homeless people call Boulder home or are just passing through, providing them with food, shelter and, hopefully, a path toward permanent housing is a large task split between government and nonprofit organizations. A mix of those entities, the homeless working group was empaneled to provide guidance to the Boulder City Council on issues related to the homeless population in the city. It convened for the first time on Wednesday afternoon inside a small conference room at the back of the West Senior Center. “We really want a good action plan for how we make the emergency services we provide to be as effective and efficient as possible,” Schwartz told the Daily Camera after the meeting. My reaction? More BS! What needs to be done is to require valid photo ID showing a Boulder County address and proof of residency for at least one year to be eligible for shelter / services here. A grace period could be granted for replacing lost ID, and transients could be given bus tickets back home (much cheaper in the long run). As the corrupt system stands now, More Homeless People = More Money for the nonprofits, so local taxpayers and kindhearted citizens are supporting the likes of Alabama transients who started the Cold Springs Fire earlier this year. I’m sorry, but this is phony compassion designed to make bleeding heart liberals Feel Good about themselves. THEY SHOULD BE ASHAMED! 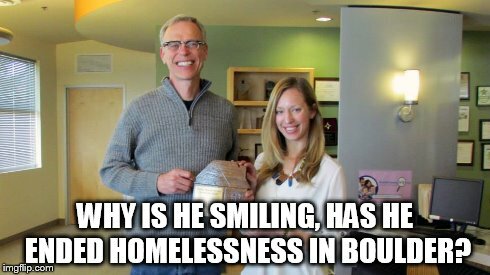 It will come as no surprise to friends and acquaintances of the Homeless Philosopher, who has blogged about homelessness in Boulder, CO since September of 2009, that he was NOT invited to attend this meeting. Differing opinions are NEVER welcomed by the do-gooders here. This entry was posted in Friends of the Homeless Philosopher, Homelessness, Only in Boulder, Politics and tagged 'Boulder homeless working group holds first meeting' on December 22, 2016 by homelessphilosopher. 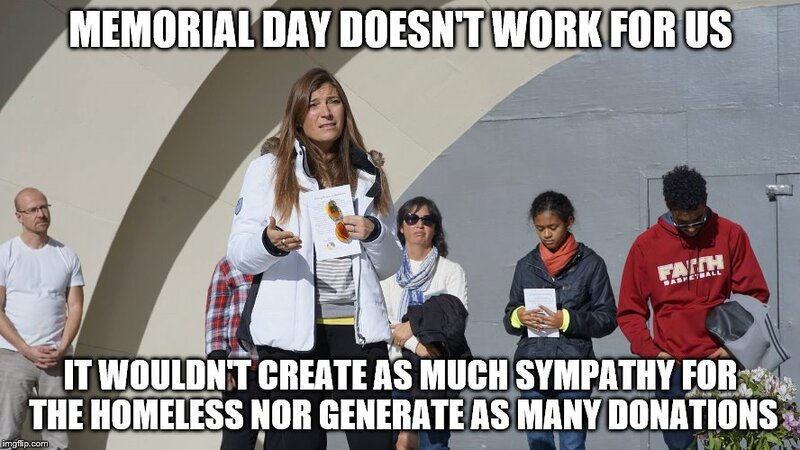 Seriously, it’s just WRONG to keep the homeless segregated even in death; let us remember them on the same day in May when we remember all of our loved ones! This entry was posted in Friends of the Homeless Philosopher, Homelessness, Only in Boulder, Politics and tagged Boulder homeless memorial, Isabel McDevitt Bridge House on December 21, 2016 by homelessphilosopher. 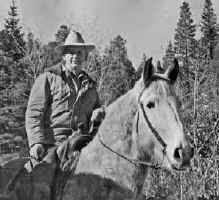 This entry was posted in Uncategorized and tagged A Cowboy's Christmas Prayer, S. Omar Barker on December 20, 2016 by homelessphilosopher. This is the official LOW temp for yesterday morning, 12/18/2016, reported in today’s print edition of the Daily Camera newspaper here in Boulder, CO.
I’d like to thank all of Boulder’s nonprofit do-gooders who make their “homeless shelters” intolerable for any sober, rational person . . . And I should also note all those here in this wealthy white enclave opposed to the Tiny House concept, who have kept me outside while more progressive cities are embracing it. 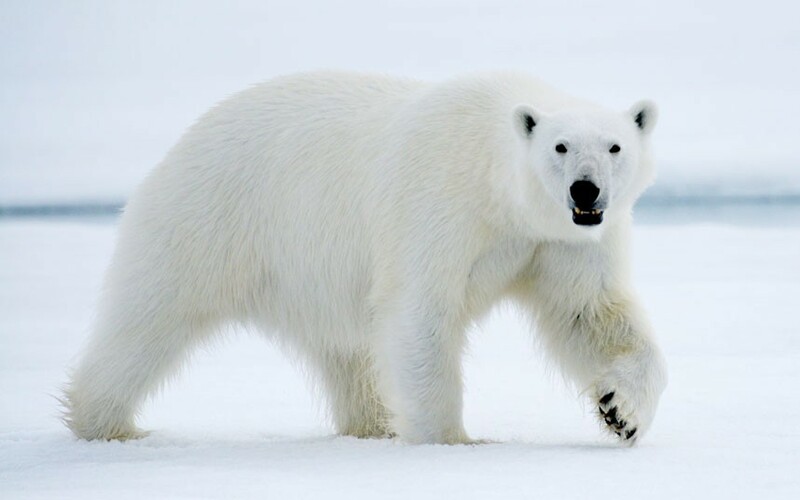 No polar bears at my campsite, and I heard only a single lonely owl overnight as the mercury dropped. I’m guessing that other living creatures crawled into their burrows just like I did. This entry was posted in Friends of the Homeless Philosopher, Homelessness, Only in Boulder, Politics on December 19, 2016 by homelessphilosopher.